“This decision was taken due to systematic failure of Naftogaz Ukraine to pay. The debt of the company for Russian gas stands at $4.458 billion, including $1.451 billion for November and December 2013, and $3.007 billion for April-May 2014,” Gazprom said in a statement posted on their website. “They’ve paid zero. Correspondingly we deliver zero,” Sergey Kupriyanov, a Gazprom spokesperson said in a press conference following the announcement. Reuters reports that gas supplies to Ukraine were restricted off as soon as the deadline at 10:00am in Moscow passed. Both companies have announced they are opening lawsuits with the Stockholm Chamber of Commerce Arbitration. #Naftogaz takes #Gazprom to Stockholm court to demand gas contract revision.Kiev wants to claim $6bln of overpayment from the Russ. company. Naftogaz, Ukraine’s oil and gas utility, is seeking a $6 billion sum for 'unfair' gas prices and asking the court to review prices that were agreed on in 2010 under then Prime Minister Yulia Tymoshenko. Gazprom announced wants to recover the $4.5 billion worth of debt and also seek compensation for Ukraine's failure to import the agreed upon amount of natural gas under their "take or pay" contract with Gazprom over the past two years. The penalty in accordance with the contract could be around $18 billion. Gunther Oettinger, who has been the main broker between the three-way talks between Russia, Ukraine, and the EU, has urged Russia to ‘reconsider’ its decision to place Ukraine on a prepayment gas plan. "Further invitations for trilateral talks in June are foreseen," EU energy minister Gunther Oettinger said at a news conference in Vienna. Oettinger has been the main broker of the three-way talks between Russia, Ukraine, and the EU, all of which have ended in deadlock. Yury Prodan, Ukraine's energy minister, has stressed that taking the case to Stockholm is the only way to settle the matter. Kiev was also late in payments in the winters of 2006 and 2009. Both periods lasted about three weeks, during which Kiev attempted to siphon off supplies for themselves, which left millions of European homes without heat. “Volumes of gas for European customers will be fully met in compliance with their contracts. Naftogaz must ensure transportation to the delivery points," Kupriyanov said. Further actions will be taken after Gazprom head meets with Russian President Vladimir Putin today, Deputy Prime Minister Arkady Dvorkovich told reporters at the World Petroleum Congress, being held in Moscow June 15-19. Russia’s energy minister Aleksander Novak and Gazprom head Aleksey Miller will hold a press conference later this afternoon. Ukraine has accumulated a multi-billion dollar debt for natural gas supplied by Russia and is unwilling to pay. It calls the 10-year gas contract that former Prime Minister Yulia Tymoshenko signed with Russia back in 2009 unacceptable and demands that Russia lower the price. The sudden halt shot up natural gas prices in Europe, a trend many analysts will repeat itself this time around. Moscow was willing to offer a discount and even recalculate the debt Ukraine has accumulated since April to account for it, but Kiev rejected the offer, saying it was not good enough. 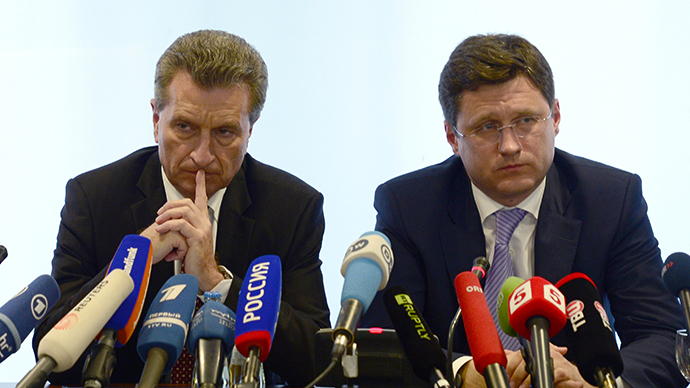 Gazprom considers Ukraine’s position a form of blackmail. After negotiations on Sunday, Gazprom announced that their final pricing offer was $385 per 1,000 cubic meters of natural gas, which Ukraine still rejected. Price disputes between the two neighbors intensified after a government coup followed by violence in Ukraine, when the price of gas exports from Moscow to Kiev shot up from $268.50 to $485.00. Europe imports a third of its natural gas from Russia, and nearly half of that is delivered via Ukraine. 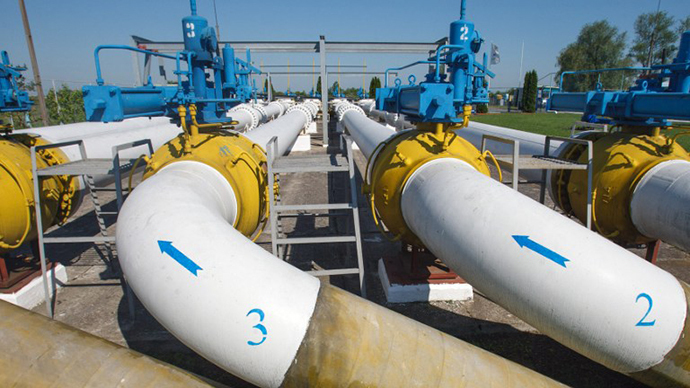 In 2012, over 84 billion cubic meters of gas traveled from Russia to Europe through Ukraine. 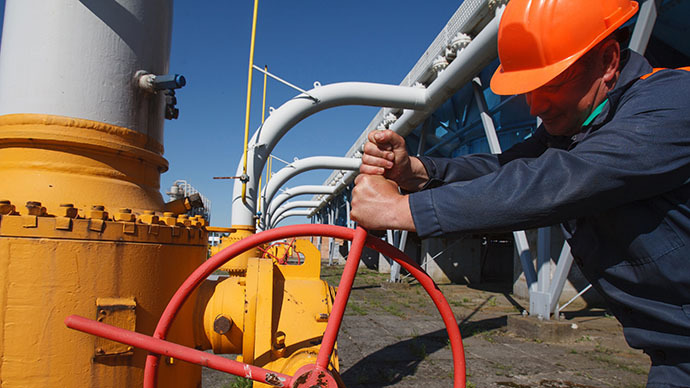 Under the current contract, Ukraine is required to import 40 billion cubic meters of gas. 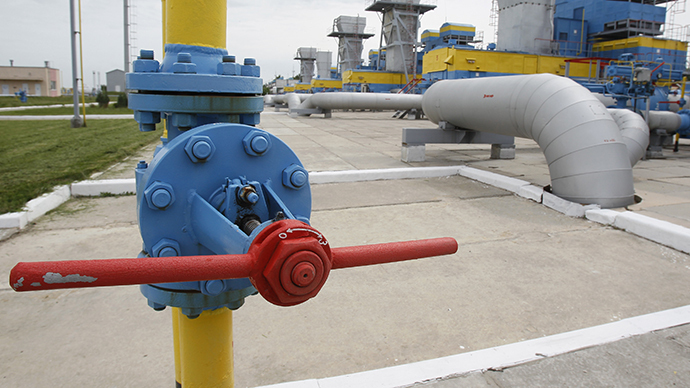 Ukraine’s energy minister said on Friday that Ukraine has more than 15 billion cubic meters of Russian gas in storage.